Each year on the frozen Lake St Moritz , the White Turf events are held over three weekends in Feburary. 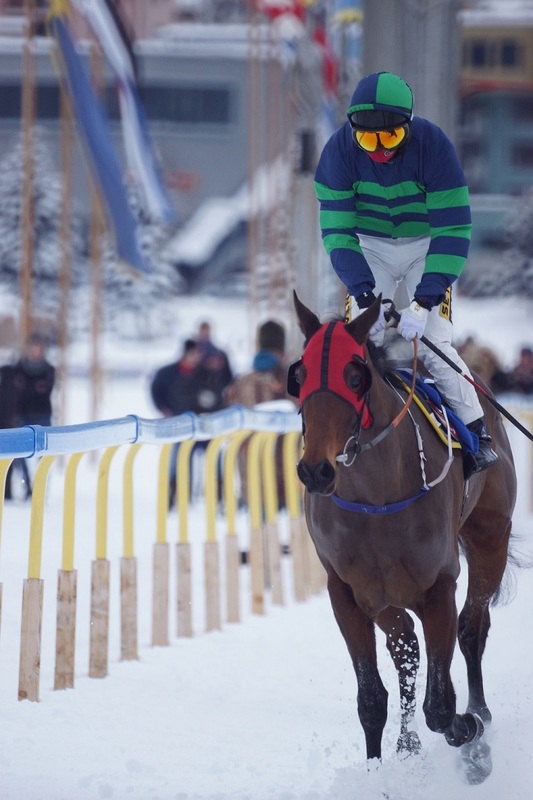 This year, Colin Keane rode Duchess Andorra to a fine win at on the final weekend in what would be final entry for Joanna Morgan at White Turf. What a way to go out! The nature of the course, on the frozen lake of St Moritz , make the racing here a unique experience for horse, jockey and spectator. Surrounded by the snowy Alps, the setting, spectacle, racing on ice and high fashion make this an event I'm pretty sure only Switzerland could put on. St Moritz - Skijöring at White Turf Skijöring on the lake of St Moritz during the annual White Turf events. St Moritz - Skijöring at White Turf - Skijöring on the lake of St Moritz during the annual White Turf events.